One of the most important investor protections in decades took effect on June 9. The new rule, issued by the Department of Labor, sets in motion a seemingly commonsense requirement that those who advise on retirement investments must put their clients’ interests ahead of their own. Yet it marks a revolution in retirement security, the result of an epic seven-year battle between consumer advocates and the financial industry that sunk millions of dollars into white shoe lobbying firms, industry-sponsored studies, congressional campaign contributions, and major lawsuits in an effort to block the rule. A new rule requires retirement advisers to act in their clients’ best interests, but Trump has committed to undoing it. Wall Street lobbyists with “more money than God” have long fought attempts to enact the fiduciary rule. Antilla details the industry scare tactics and industry-funded research marshaled by the rule’s opponents. Since the rule was already final when President Trump took office, it was invulnerable to his day one directive freezing all pending rule making. Nevertheless, within two weeks Trump signed a memo directing the DOL to review the rule and potentially rescind it. In March, before Trump’s labor secretary had even been confirmed, the Department of Labor issued a proposed rule delaying implementation for 60 days — bringing us to June 9 of this year. In April, Sen. Elizabeth Warren joined consumer groups and the AFL-CIO to unveil a “Retirement Ripoff Counter,” a digital projection tallying the costs to retirement savers of delaying implementation of the rule — which they calculated at $46 million a day. And in late May, Alexander Acosta, Trump’s newly minted labor secretary, announced in the pages of the Wall Street Journal that the administration had exhausted every “principled legal basis” for further delaying the rule. And so it was that key portions of the fiduciary rule finally went into effect last month. Whether the rule will survive the Trump administration’s deregulatory campaign is an open question. Listen to Susan Antilla’s August 2017 interview on WNYC’s The Leonard Lopate Show. He liked what he heard from Jack W. Teboda that evening in Sycamore, Illinois. A handout described Teboda as an adviser who employed conservative strategies and chose investments “that are best suited for my clients.” His two-page bio ended on a personal note. His wife of 30 years had been his high school sweetheart, and they attended the Harvest Bible Chapel in nearby Elgin. “Our relationship with God is the most important aspect of our lives,” it read. Sitting beside his wife in Teboda’s office later that month, Wingate moved his entire retirement account of $282,000 from IRAs that had been invested in plain-vanilla Vanguard and Janus mutual funds into two risky, real-estate investment trusts, known as REITs, that invested in and operated commercial properties. “I am totally disappointed with what you have done with my account …These are my life savings in your hands.” The funds that Wingate liquidated had annual fees of less than one-half of 1 percent. Andrew Stoltmann, the Chicago lawyer who will represent Wingate in an upcoming arbitration against Teboda and the broker-dealer he is registered with, said that the REITs that replaced them, which were highly illiquid and not publicly traded, offered Teboda a 7 percent commission off the top, immediately zapping more than $20,000 from Wingate’s savings. Wingate was thunderstruck three years later by news that the private market value of one of the REITs, Behringer Harvard REIT I, had dropped from $10 to $4.25 a share. Teboda said to hang tight, but Behringer Harvard didn’t rebound. Last year, after consulting with a new adviser, Wingate sold both REITs at a loss of $147,000, half the original value of his retirement account. Like other securities linked to real estate, Wingate’s REITs lost value during the collapse of real estate prices during the financial crisis. But even under the best of circumstances, these products were too risky for anyone approaching retirement. A Vanguard stock index fund, by contrast, had almost completely recovered its pre-crash value by the end of 2010. The Dodd-Frank reforms passed in 2010 tackled some of the blatant investment risks to average Americans. In addition to measures designed to rein in too-big-to-fail banks, the law sought to protect consumers by mandating the creation of a Consumer Financial Protection Bureau, putting new restrictions on the packagers of asset-backed securities, and directing the Securities and Exchange Commission to study whether stockbrokers should be held to a “fiduciary” standard. But it did not target the excessive fees that cut into the returns of the nation’s retirement savers. The same year that Dodd-Frank was signed into law, the Department of Labor, which has jurisdiction over retirement accounts, unveiled its own draft fiduciary rule. While the SEC dragged its heels, the DOL doggedly pushed its proposal through the federal rule-making process. In July 2009, an outspoken former House staffer and public health professor was taking her seat at a daily staff meeting on the fifth floor of DOL headquarters in Washington, D.C. Phyllis Borzi, who had just been sworn in as assistant secretary, charged with running the Employee Benefits Security Administration, had asked her nine office directors to come prepared with a list of their top priorities, the issues they would want on the agency’s agenda if they had her job. As Borzi listened, most of the directors singled out the same concern: Retirement accounts were hemorrhaging money because of high fees and inappropriate investments, but the agency had limited legal tools to hold the offenders accountable. The law at the time typically put the fiduciary onus on sponsors of retirement plans, often small employers struggling to set up 401(k)s for their workers. Many of those sponsors, Borzi’s team suggested, were making bad decisions based on the advice of financial experts, resulting in avoidable losses for participants. For years, those loopholes hadn’t mattered much, as Americans had relied on employer pensions that provided a steady stream of income in retirement. But by 2013, after decades of corporate cost-cutting, pensions constituted only 35 percent of retirement assets; more than half were in so-called defined contribution plans such as and IRAs and 401(k)s.
Brokers had an irresistible opportunity to steer naïve clients to opaque products that offered the biggest commissions, said Sarasota investment adviser Raul Elizalde. They were also legally permitted to choose funds whose annual fees were higher than equivalent investments. “The model of the financial industry under the suitability rule is to take it little by little — and many times,” he said. Perhaps most perilous for the burgeoning ranks of small investors was a shift in the industry’s marketing strategy: Stockbrokers, once understood as salespeople, began to call themselves “advisers,” a title that had been used previously only by so-called registered investment advisers who were required to operate as fiduciaries. Despite the conclusions of its own research, the SEC chose to do nothing about the misleading titles. “We are concerned that any list of proscribed names we develop could lead to the development of new ones with similar connotations,” it wrote at the time. By October 2010, just after Dodd-Frank was signed into law, Borzi and her team had designed a proposed fiduciary rule that would shut down ERISA’s loopholes and introduce a new definition of fiduciary advice. But her first stab at a rule was met by ferocious attacks in comment letters and public statements from the securities industry, afraid it would undermine its commission business, and the insurance industry, concerned the rule would make it harder to sell lucrative annuity products. In the year following the release of the proposed rule, not a single consumer group registered to lobby in support of the rule. But the Chamber of Commerce; industry lobby groups including the Securities Industry and Financial Markets Association (SIFMA) and the Financial Services Roundtable; major firms that offer mutual funds and annuities such as Fidelity Investments and Prudential Financial; and major financial firms including JPMorgan Chase, Charles Schwab, and Blackrock sent lobbyists to quash various aspects of it — altogether 37 organizations that cumulatively spent more than $61 million on lobbying that included the fiduciary issue during that period. Americans lose $17 billion a year in retirement savings due to advice compromised by conflicts of interest. Dodd-Frank had required the SEC to study a possible fiduciary standard, too. As part of that process, the SEC solicited public comment and held sit-down meetings with industry and consumer groups. Of the 111 meetings the SEC held between August 2010 and October 2012, only 31 were with groups promoting stronger fiduciary requirements. The SEC’s 80 meetings with industry included 15 with SIFMA, which represents security firms and banks; eight with the Financial Services Institute, which represents brokers; and 14 with insurance companies and trade groups. After producing a study that recommended establishing a fiduciary standard, the SEC’s efforts stalled. “They had been ‘studying’ the issue for years but never took the next step and actually proposed something,” said the Consumer Federation’s Hauptman. In the years that followed, Borzi said, as she oversaw the development of a new rule, the disproportionate influence of the financial industry was constantly an issue. As the DOL moved toward a final rule in 2016, the number of organizations registered to lobby against it multiplied. Throughout, consumer advocates, who universally support the rule, have been outflanked. Of the 98 organizations that declared they lobbied the Senate on the fiduciary rule in 2016, only 11 were unambiguously in favor of the rule. Members of the financial industry prefaced many of their public comments with vague endorsements of a best-interest standard, but these letters typically went on to complain about portions of the rule that didn’t serve their interests. Those lobbying in favor, including the AARP, the American Association of Justice, which represents trial attorneys, and the AFL-CIO, spent a total of $23.9 million on lobbying during the quarters when they were active on the rule. Along with its big spending on lobbyists, the financial industry has also splashed its largesse directly to lawmakers. In a study released in March based on public filings, Americans for Financial Reform found that the financial sector was by far the biggest business category contributing to federal candidates for office and their leadership PACs during the 2015-16 election cycle, spending $1.1 billion. Among the top 20 contributors? The American Bankers Association, SIFMA, Wells Fargo, New York Life Insurance, and the Investment Company Institute, the trade group for the mutual fund industry — all of which have filed comment letters opposed to the DOL’s rule. The brokerage industry argues that since the new rule discourages use of the commission-based accounts that are common among small investors, it will effectively cut off average retirement savers from access to investment advice. The insurance industry claims that the rule will impede access to products, including annuities, which provide investors with guaranteed income. The stakes, apparently, are high. The consulting firm A.T. Kearney calculated last year that it will cost the financial industry as much as $20 billion in lost revenue by 2020 to comply with the rule, in part because it will dramatically reduce the fees the industry collects from investors. While hearings about the rule were in progress in August 2015, a coalition of insurance companies called Americans to Protect Family Security aired a classic scare-tactic television ad that featured a couple heading home in the car after dropping their daughter off at college. When the wife says that government bureaucrats want to “make it really hard” to get advice from “Ann,” their financial adviser, her husband is indignant. “We’re gonna call our senators,” he says with resolve. In another ad that month, this one sponsored by the conservative group American Action Network, an investor who can’t get through to a human at his brokerage firm hears the doorbell ring only to discover a drone hovering at his front door. Hanging from the drone is a sign that reads “NOTICE: NO PERSONAL SERVICE FOR YOUR IRA.” The group, founded by Fred Malek, a former assistant to Presidents Richard Nixon and George H.W. Bush, spent $5.6 million during the 2016 federal elections, according to OpenSecrets. The research behind these claims is sometimes thin. The Investment Company Institute, the mutual fund trade group, filed a comment letter to the DOL this year in opposition to the rule, claiming that it had “informally surveyed” its mutual fund members and discovered that 31 out of 32 funds had either received “orphaned” accounts from brokerage firms or gotten notice about accounts that would be orphaned by the firms that previously held them. An ICI spokesperson said in an email that this would be harmful to investors because they would lose access to financial advice and the convenience of having a single financial institution hold all their funds in one place. As for the risk of modest investors losing access to a brokers’ advice? “I’m not so sure at the end of the day that that’s bad for the investor,” Rotblut said. 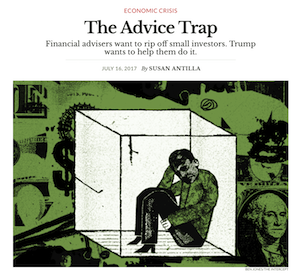 “In fact, quite the opposite — some of these so-called advisers are just glorified salespeople who’ve passed a regulatory exam.” He recommends that investors consult with an hourly financial adviser instead. The Chamber report also referred to a post by Meghan Milloy, director of financial services policy at the conservative American Action Forum, in which she suggests that most consumer claims are baseless. Citing Milloy, the report said that consumers filed nearly 4,000 arbitration cases last year with FINRA, the Financial Industry Regulatory Authority, alleging wrongdoing by brokers, but that only 158 — about 4 percent — of those cases were decided in favor of the consumer. In a telephone interview, Milloy initially said that the FINRA arbitration statistics were evidence of the prevalence of “baseless claims” by investors. When I pointed out her substantial error, she responded that it was “still less than a majority” of cases decided in favor of consumers. She has not corrected her original post, which on June 29 was cited in a letter to the SEC from lobbyist Kent A. Mason of the Washington, D.C., law firm Davis & Harman on behalf of an unnamed “group of firm clients.” Mason told the agency that its role protecting IRA investors would be “reduced dramatically” under the rule. To boost its claim that the fiduciary rule will hurt average Americans, the Chamber features on its website small business owners who express deep concern over the new standard. The government watchdog group Public Citizen got in touch with some of those businesspeople, only to learn that several had little knowledge of the rule. One business owner, Richard Schneider of Ellisville, Missouri, was quoted on the Chamber’s website saying that the rule would mean more paperwork and hurt his employees. “The Labor Department should just fix this rule already,” he said. When contacted by Public Citizen to hear more about his views, though, Schneider said he didn’t follow the rule closely. Another person featured on the Chamber’s site, Jim Dower, runs a nonprofit in Chicago. The Chamber quoted him as saying that the “DOL may have the right intention … but I’m worried they’ll still get it wrong in the end.” When Public Citizen emailed him about his comment, Dower responded, “Who do I call to get this down?” The Chamber has since removed him from its site. Even as securities firms assailed the fiduciary rule in the lead-up to its June 9 effective date, they continued to deliver marketing messages suggesting they already were serving clients at the elevated standard. On their websites, firms large and small pledge to variations on the themes of “clients first” and advice given “with our clients’ best interests in mind,” despite allowing brokers to pitch high-commission products or illiquid investments, like the non-traded REITs sold to Wingate, that are ill advised for all but the wealthiest investors. In a study of 81 non-traded REITs published in 2015, McCann, the former SEC economist, found that REIT investors over the past 25 years would have earned as much or more by investing in U.S. Treasury securities. More than half their underperformance, he found, resulted from the upfront fees charged to investors, which largely went to brokers. Opponents of the DOL rule suggest that improved disclosure would solve many of the problems the rule was designed to fix. But Anthony Pratkanis, a professor of psychology at the University of California, Santa Cruz, who has studied the characteristics of financial fraud victims, said that’s nonsense: “Consumers and investors do not read disclosures. Period.” Multiple studies have shown that even the people who do read them don’t understand them, he said. A 2012 report from the SEC found that investors often don’t even understand the information they get from brokers about their trades: Only 53 percent of respondents in an online survey of 1,200 investors could correctly identify a trade confirmation as having been for a stock purchase. After five more years, four more days of public hearings, thousands of comment letters, and hundreds of meetings, mostly with industry representatives, the DOL finally published its new rule on April 8, 2016. It took the U.S. Chamber of Commerce and eight other business organizations less than two months to file suit against the agency, saying it had exceeded its authority. In February, a Dallas federal judge ripped apart their arguments in an 81-page opinion denying summary judgment. To a complaint that the DOL had violated the freedom of speech of insurance agents and brokers, Chief Judge Barbara M.G. Lynn of the Northern District of Texas said, “At worst, the only speech the rules even arguably regulate is misleading advice.” The Chamber and the other litigants have appealed. In a draft bill in early July, Wagner proposed that the rule be eliminated and replaced with a new standard of conduct that would require investment recommendations to “be in the retail customer’s best interest.” But Wagner’s bill lacks the protections of the DOL rule and fails to adequately address the “complex web of toxic financial incentives” that lead to bad advice, according to a July 11 letter to members of the House Financial Services subcommittee from the Consumer Federation of America. In the 2015-16 election cycle, insurance companies, securities firms, and commercial banks were the top three industries backing Wagner’s campaign, donating more than $549,000. The two firms that gave the most were Jones Financial Companies, a brokerage firm, and the insurance company Northwestern Mutual. Both wrote to the DOL to oppose the rule. Over the last two election cycles, the financial industry contributed more than $1.1 million to her campaigns. There in the Oval Office, she referred to the executive order as “my baby,” claiming that the edict would help “low- and middle-income investors and retirees.” It was, she said, a “big moment” for Americans who invest and save. A Wagner spokesperson did not respond to requests for comment. Three months later, in a May 22 Wall Street Journal op-ed, Acosta said that the DOL should examine ways to revise the rule and open up yet another comment period. Acosta’s arguments, said Barbara Roper, director of investor protection at the Consumer Federation of America, were “straight from the talking points of industry.” A DOL spokesperson declined to comment. Acosta’s op-ed appeared just weeks before the House Financial Services Committee passed the Financial CHOICE Act, an omnibus bill designed to roll back many of the Dodd-Frank reforms. The bill would repeal the DOL’s fiduciary rule and block the DOL from promulgating a new one until at least 60 days after the SEC issues a final fiduciary rule of its own. In his request for comment letters, Clayton noted that Acosta wanted the two agencies to work together to analyze the standards of conduct for brokers and investment advisers. Judith Burns, an SEC spokesperson, declined to comment. Lisa Donner, executive director at the consumer advocacy group Americans for Financial Reform, worries that the DOL rule, just weeks after taking effect, is already “in danger of being undone.” On June 29, the undoing began, with a request for comment from the DOL asking whether the remaining aspects of the rule, which as of January 2018 would require legally enforceable contracts between clients and any brokers who receive commissions, should be further delayed. Wingate, now retired, said the catastrophic loss to his retirement account has been “really rough” on his wife, who at 69 continues to work as a nurse to compensate for the lost savings. To make ends meet, they sold the family vacation condo in Florida earlier this year. “It was a real strain on our marriage,” Wingate said. Wingate and his lawyer, Andrew Stoltmann, say they will face off in November against Teboda and the broker-dealer he was formerly registered with, ProEquities, at a FINRA arbitration hearing. ProEquities spokesperson Eva T. Robertson and Teboda declined to comment, but ProEquities said in its answer to Wingate’s complaint that he is a sophisticated investor who was able to “talk intelligently” with Teboda.